Slaying dragons – Hello Korea ! Went to the International Women’s Film Festival of Seoul with friends last week and got to watch Elaine Kim’s (Berkeley professor of Asian studies) Slaying the Dragon: Reloaded. Highly recommended. I showed it to my kids today, along with a brief history of Asians in America and an explanation of various racial slurs and ones I experienced. I also talk a little more about being an Asian man, as they are feminized and disempowered in America. I entreated the students to be sure their partners loved their minds and hearts and not their image, and also to please be generous towards their gyopo brothers and sisters, because they too don’t have an easy life. Kim Sook Ja contacted me (yayy!) ready for testing and says she’s just been really busy. The DNA testing has been purchased and as soon as we get the tests, it will be another 6 weeks thereafter. It takes a long time for sibling testing of unknown origins, as there are lots of different things to test for and probabilities have to be calculated. So, we’re looking at about two months I think. In reality, I get less and less curious as time passes. I guess because I’m less angry and just want to move on with my life. But we still persist with the testing because it’s nice to know the truth. My house is a total disaster, ’cause I’ve been working on TRACK stuff ’round the clock. Like this image I frankensteined together and still had about 50% more work to go, so please excuse incomplete colors or mismatching colors or the wrong contrast or stringy hair, etc. The one Korean who’s seen it said it was “surreal” because a) real mihonmo can’t afford expensive hanbok and b) modern Koreans don’t wear hanbok. 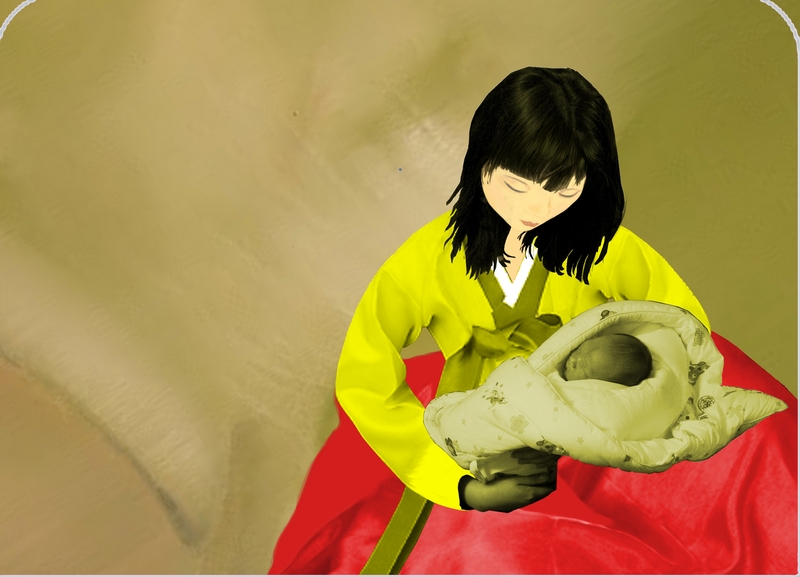 I chose yellow jeogori and red chima because those are the traditional colors ascribed to young women. Of course, I knew that peasants all wore white, but others told me that despite Korea being known as the people in white, young women were still portrayed in literature and paintings as always wearing yellow and red. The problem becomes, how do you portray unwed status in modern times? Even married people in Korea don’t wear their wedding rings…Also how do you represent a beautiful but repressive past with its legacy of stigma and female oppression and justapose it with the consequences for women today? Another person told me that maybe the girl in historical hanbok is akin to having an American dress in colors of the flag. Or I can take that further and say it’s like a girl dressed up in her anti-bellum cotillion hoop skirt ballgown..Anyway, this idea has been round filed, so that’s why I’m showing it to you. But I also think it still had potential -precisely because it IS weird in its Korean context. So instead of washing out all the detracting opinions, I think what I really needed to do is push it further into controversy. (nobody understood my other art project, for example) The other constraint was that at the end of the day it must be beautiful, for the cursory view, the superficial view, as it was to actually be a decorative piece on an item that people will carry around with them. Other stuff is mocked up instead.